Some barstools take beauty to the extreme and neglect comfort. Others focus on comfort and neglect to give attention to the look and feel of a chair. This bar stool makes a brave attempt, and succeeds, at meeting needs of both form and function. 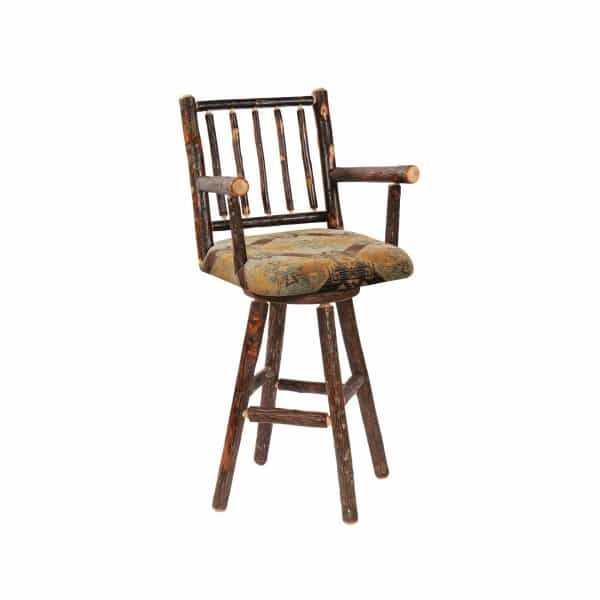 Rustic takes on a whole new meaning with the hickory treatment on the Hickory Upholstered Swivel Barstool with Arms. The hickory wood has the bark intact and is covered only with a clear protective coating. This allows the natural beauty of the American grown hickory wood to shine. Then, the barstool features everything necessary for a good long seated evening, perched at your home bar or entertainment space with friends. The barstool features a high back, armrests, footrests, and a comfortable upholstered seat that sits on a functional swivel. Take advantage of the well-rounded barstool made by the famously reliable and always stylish Fireside Lodge Furniture. Hickory Logs from Southeastern U.S.A.